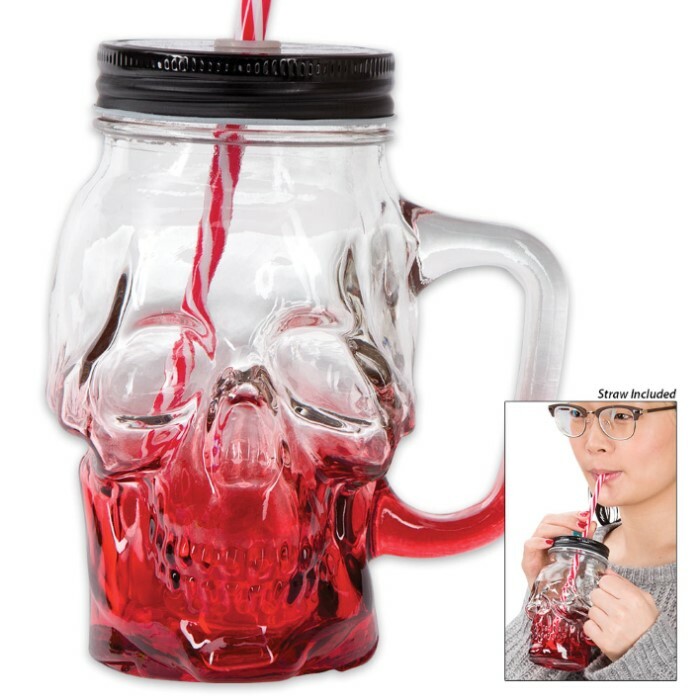 "The Crimson Cranium" Skull Mason Jar Glass with Lid and Straw | BUDK.com - Knives & Swords At The Lowest Prices! 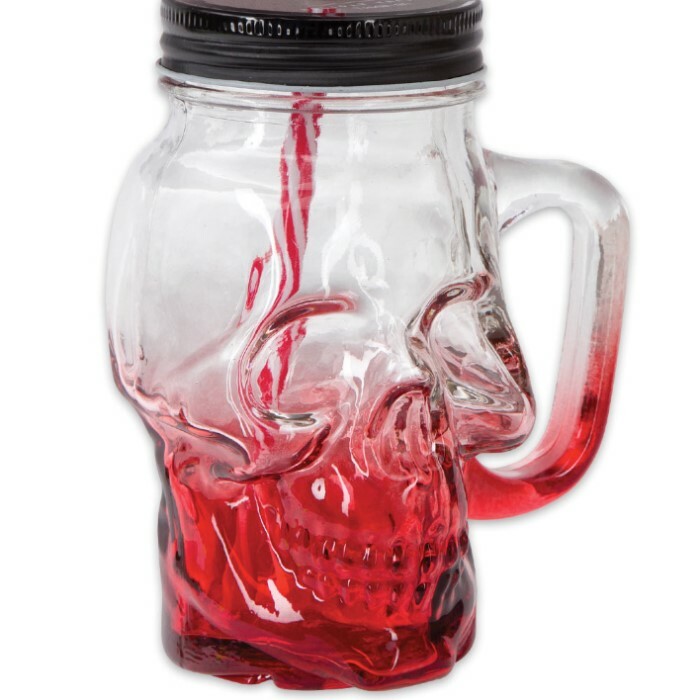 When mama says she used to drink from a mason jar, she surely wasn’t talking about the Crimson Skull Mason Jar Glass. 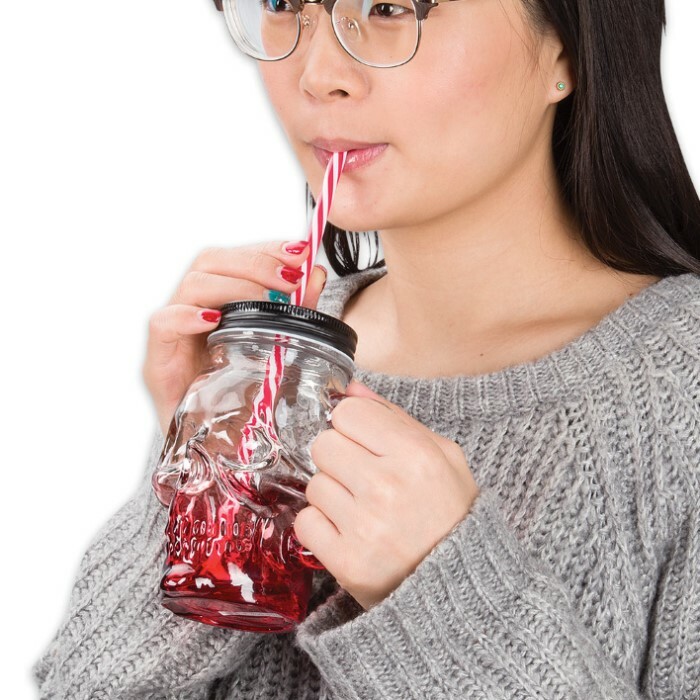 A spooky, but oh-so-awesome take on the traditional canning jar, this glass is sculpted in the shape of a human skull, teeth sinuses and all, and tinted red - deep crimson at the bottom, gradually fading to light red and eventually crystal clear towards the lip. More than a mere novelty glass, this distinctive tumbler features a black metal screw-top lid (similar to those on ordinary mason jars), solid glass handle and a tough plastic candy cane-striped straw. You’ve just gotta bring one of these to your next traditional family dinner! Laughter is sure to ensue as your elders think back to sipping lemonade or iced tea from a far more humdrum version of this unique glass beauty. Also looks great displayed among darker home décor. Holds approximately 13 oz of your favorite beverage. Makes a great gift for gift for goths, modern vampires and anyone with a taste for the bizarre. Measures 5 1/2" tall; lip is 2 1/2” in diameter.